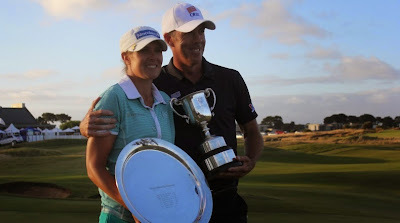 Tour professionals Richard Green and Marianne Skarpnord got engaged only about 10 days ago. That was a pretty amazing week for them. But what happened this week is even more amazing - at least for the rest of us. Perhaps one of the unlikeliest holes-in-one ever caught on camera! Is it possible that Green could top that hole-in-one in the tournament proper? Maybe the only way he could was to win the tournament - which he did, in a 2-hole playoff. But what about Skarpnord? Surely she was completely overshadowed by her boyfriend's exploits. Wellllll, not so fast. Marianne was playing in the Ladies Oates Victoria Open - and she won, too! Green and Skarpnord, engaged to be married, and tour winners on the very same day! The men's Vic Open was part of the PGA of Australia tour; the women's Vic Open part of the ALPG Tour. There haven't been a ton of husband-wife or boyfriend-girlfriend couples on the pro golf tours, fewer than you might imagine, in fact. But among those that have existed, none have ever posted matching, his-and-her wins on the same day. What an awesome week for Green and Skarpnord. It was so awesome that they deserve the creation of a new word: They aren't lovebirds, they are lovebirdies.